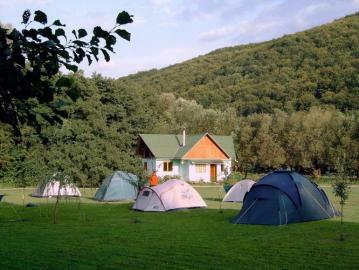 The camping is situated at the side of the Niraj creek, in the remote village of Câmpul Cetatii, the last village on the road before the road gets to the Gurghiu Mountains. The family, Eva and Gyorgy Birtok were one of the pioneers of ECEAT. Gyorgy was for several years the mayor of the village but he preferred to dedicate more time to tourism activity and they build their camping in a very nice place. The camping is situated not too far from the margin of the forest. It is a special place for camping, for 20 tents or caravans with sanitary facilities, a kitchen and electricity. Gyorgy is ready to show you the surroundings. You can work at the small farm of the family, if you like.